One software for all your portable metrology devices? 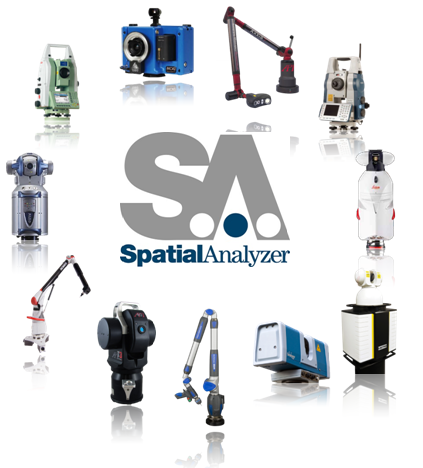 Instrument-independence–it’s something that makes SpatialAnalyzer® (SA) from New River Kinematics (NRK) a highly unique software package. Since its inception, SA has supported a wide range of portable metrology instruments and the list of supported devices is always growing. NRK continually adds new instrument interfaces to the software as new instruments hit the market and as manufacturers upgrade instrument technology. Instrument-independence–it’s something that makes SpatialAnalyzer® (SA) from New River Kinematics (NRK) a highly unique software package. Since its inception, SA has supported a wide range of portable metrology instruments and the list of supported devices is always growing. In fact, the lack of an instrument-independent software package was one of the inspirations that initially led the NRK co-founders, Bob Salerno and Joe Calkins, to develop SA in the mid-1990s. Synthesizing and analyzing data from multiple instruments proved to be very difficult and time-consuming without the help of a universal software platform. So, Salerno and Calkins set out to create the solution they (and many others) needed. Today, they continue to develop and enhance SA in order to meet the everevolving needs of portable metrology users and the latest developments from instrument manufacturers. Offers greater flexibility when working with various measurement devices. Streamlines the collection, integration, and analysis of data. Provides simple, common interfaces for each class of instrument. Reduces the amount of investment in software. Eliminates the need to train staff on multiple software packages. NRK continually adds new instrument interfaces to the software as new instruments hit the market and as manufacturers upgrade instrument technology. It’s also important to note that all instrument interfaces are included in both SA Professional and SA Ultimate.